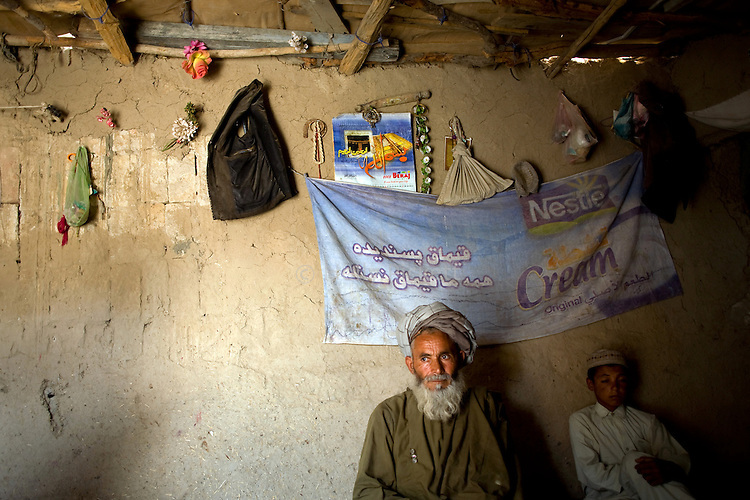 Khalik Daad, 60, sits with his son Wali, 14, in their small mud hut near the home of Kandahar Provincial Council Chairman Ahmed Wali Karzai, who is also the brother of President Hamid Karzai, in Kandahar, Afghanistan, Aug. 21, 2009. Daad's 10-year-old daughter Jamila was killed instantly yesterday when a rocket hit the building next door and shrapnel fell into the hut where the family was preparing lunch. Daad's wife and another young daughter were also injured and taken to the hospital. "This is not the work of Muslims," Daad said. Two people died and three more were injured in Kandahar as the city was bombared by rockets throughout Afghanistan's presidential election day.